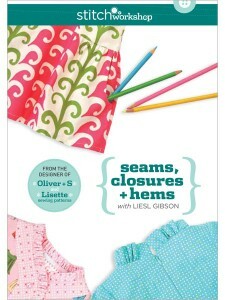 We’re happy to announce that Liesl’s two video workshops, Seams, Closures + Hems and Apparel Sewing Basics, are now available for purchase here on the Lisette site. To celebrate, we’re giving away a copy of the second of the two DVDs. To enter the drawing for a free copy of Seams, Closures + Hems, leave a comment telling us what your favorite seam finish is. The drawing will run until 1:00PM ET on Dec. 1 at which point we will turn comments off and will ask our friends at Random.org to help us pick a winner. If your name is drawn, we’ll contact you via email to get your shipping address. Oh, I certainly agree with the french seams! They’re quick to do, easy to calculate and look so nice when you’re done. Another vote for french seams, although I am not very good at them. I love how they look though. I enjoy hemming by hand. Not v good at it, but there’s a certain pleasure in it. French seam! When I learned it, I got really excited that I could now make clothes that looked clean and professional made even without a serger. I would LOVE these DVDS – crossing my fingers. I really like flat-felled seams even thought they are not practical for tons of clothing. French seams or pinked edges — the later happens more often because I don’t have to think as much! Hong Kong seams are really cool, although I’ve never attempted them myself. Heidi squeezed in just under the wire. Comments are now closed, and we’ll run the drawing shortly.